WWII was over but a new war had started a war that would last roughly from 1947 to 1991. It was a war of ideologies, political tension and of threats of nuclear holocaust. The Cold War split the temporary wartime alliance against Nazi Germany, leaving the USSR and the US as two superpowers each armed heavily in preparation of a possible all-out nuclear world war. It was the time when defence forces were forced into a complete rethink in terms of strategies and assets. It was the time of highflying bombers, nuclear submarines and intercontinental ballistic missiles all armed with nuclear warheads designed to wreak havoc and to decimate whole countries. It was also the time of the high speed interceptor. 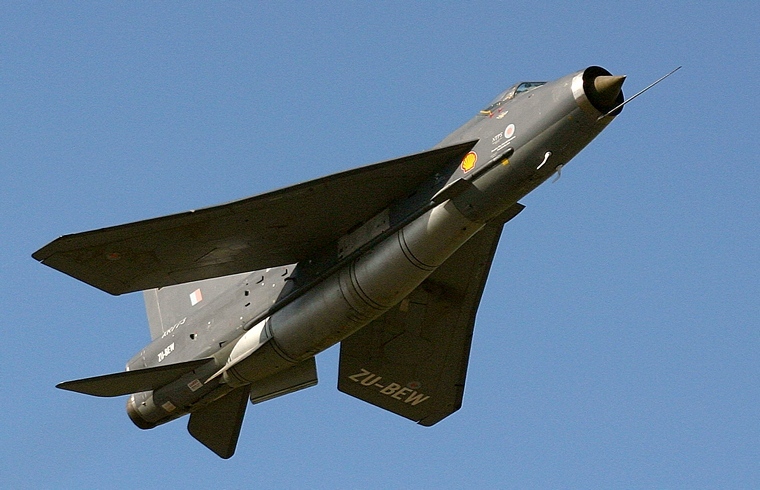 The interceptor basically had one function only, to defend the homeland from bomber attack. To best fulfil that function it was required to accelerate rapidly, have a top speed well above Mach 1.5 and climb to extreme heights in the shortest possible time. Range and combat endurance was not high priorities. To fulfil its function as a bomber killer the UK Air Ministries specification called for an interceptor able of all of the above whilst equipped with two Aden canons, an interchangeable fuselage weapons pack with either an additional two canon or 48 two inch air to air rockets or two Firestreak air to air missiles. Also specified was an on-board Ferranti AI.23 radar for weapon guidance and ranging, as well as search and track functions. 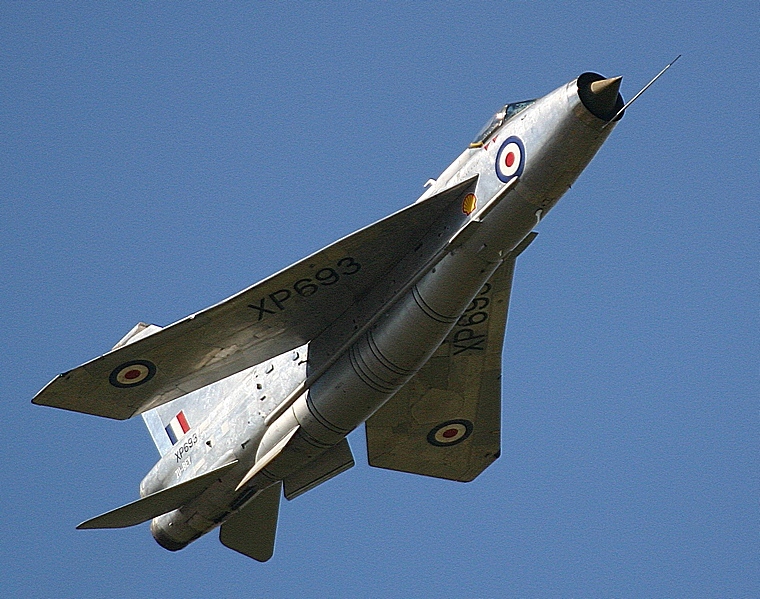 Manufactured by English Electric, later the British Aircraft Corporation, the Lightning had its first flight on 4 August 1954. It was typically British, looking like no other aircraft then flying and was the only all-British Mach 2 fighter aircraft and was the first aircraft capable of super cruise. Since the Rolls- Royce engine selected were not yet available the first prototype was powered by two un-reheated Armstrong Siddeley Sapphire turbojets stacked one on top of the other inside the fuselage. Production aircraft were powered by various models of the Rolls-Royce Avon engine initially rated at 11,250 lbf (50.0 kN) of dry thrust. 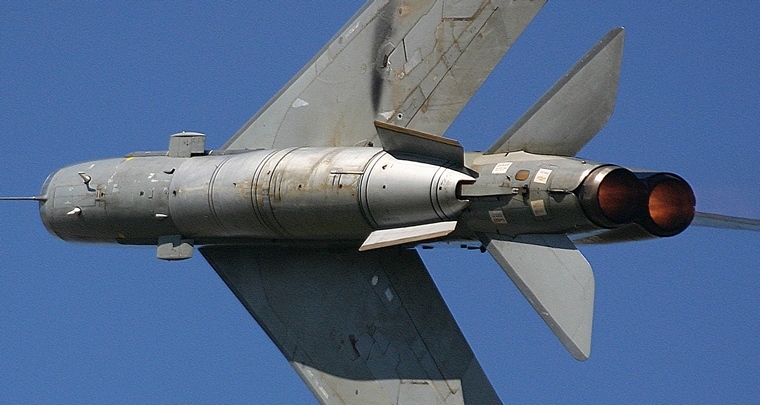 Fitted with a four stage afterburner thrust increased to 14,430 lbf (64.2 kN). 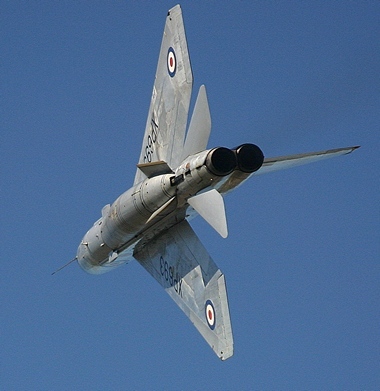 The power plant configuration made the Lightning unique, the wing and tail plane made it different and instantly recognisable. Borne out of the need for high supersonic speeds the 34 feet 10 inches (10.6 meters) wings were swept at 60 degrees. The wing roots starts just at the aft end of the canopy the inner tips in line with the roots of the similarly swept horizontal stabilisers. 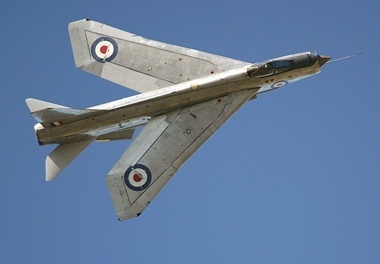 The Lightning looked the part; it was the interceptor that set the standard. Climbing at an incredible 20,000 feet/min (100 m/s) it had a service ceiling of 54,000 feet (16,000 m) but could zoom climb to more than 70,000 feet (21,000 m). During a NATO exercise in 1984 a Lightning F.3 piloted by Flight Lieutenant Mike Hale intercepted a U-2 at 66,000 feet (20,000 meters) a height that was considered safe from any interception by the U-2 crews. Hale also set a climb record to 88,000 feet (27,000 meters). At that height the sky was quite dark and the curvature of the earth visible. In the words of a Lightning pilot, �you strap her on, take off and point the nose skyward and she will fly you to the moon�. In time to height acceleration trials pitted against a Lockheed F-104 Starfighter the Lightning won hands down. During April 1985 British Airways had its supersonic Concorde on trial and it was the ideal �target� on which NATO forces then equipped with Mirages, F-104 Starfighters, F-14 Tomcats, F-15 Eagles, F-16 Fighting Falcons and Lightning's could practise stern conversion intercepts. Hale, flying the multi role F.53 a development of the F.6, was the only aircraft in the arsenal able to intercept and overtake the Concorde. British Lightning's never fired a shot in anger but has the dubious honour of being the first aircraft to shoot down a Harrier. The incident happened during 1972 when a British pilot suffered engine failure in the jump jet and ejected. However, instead of crashing the Harrier kept on flying heading for the East German border. To avoid a diplomatic incident the Lightning pilot was task with intercepting the Harrier and ordered to shoot it down a task that it accomplished. 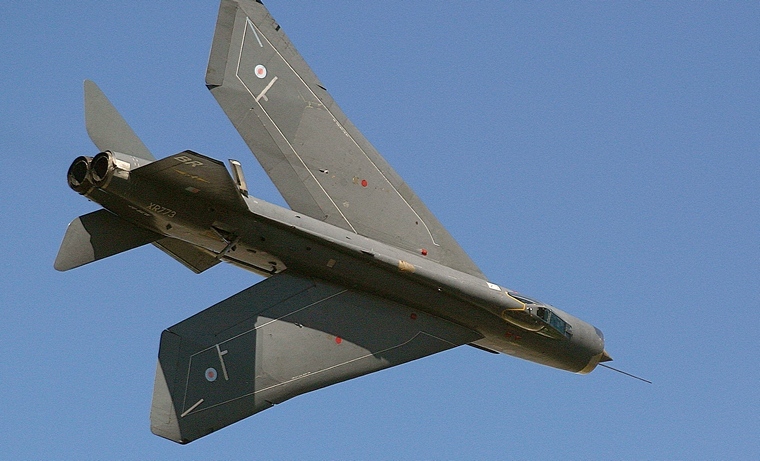 In December 1968 twelve F.53k and two T.55k Lightning's were exported to Kuwait. 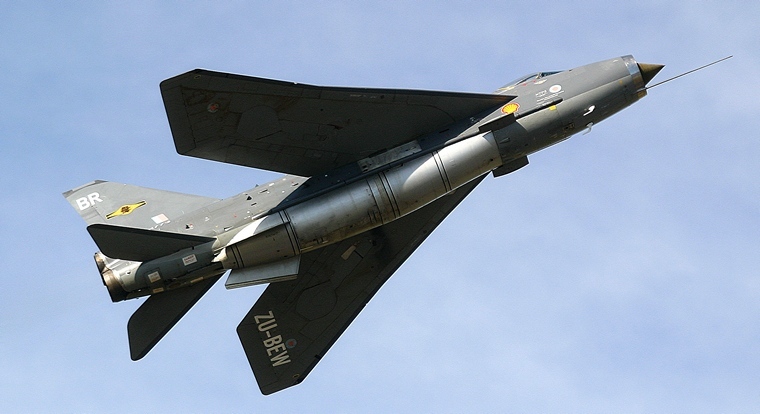 Maintenance of these aircraft was poor and serviceability suffered and in 1977 they were replaced by Mirage F-1s. The remaining Lightnings were placed in storage at Kuwait International Airport where they were destroyed during the 1990 invasion by Iraq. 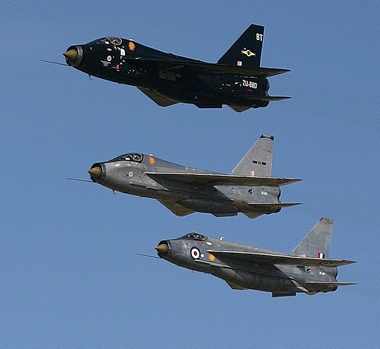 Saudi Arabia was the only other operator of the Lightning having ordered 34 F.53s and six T.55 trainers. The F.53 was able to operate in the ground attack and air defence role and between December 1969 and May 1970 saw service during the South Yemeni border dispute. One Lightning was shot down by Yemeni ground forces. Supported by Egyptian Forces regular sorties were flown into Saudi airspace and to counter this six ex-RAF Lightning's, four F.2s and two T.4 trainers as well as six Hawker Hunters were delivered to the Royal Saudi Air Force (RSAF). Flown by contract pilots this force was responsible for cessation of the Egyptian incursion. 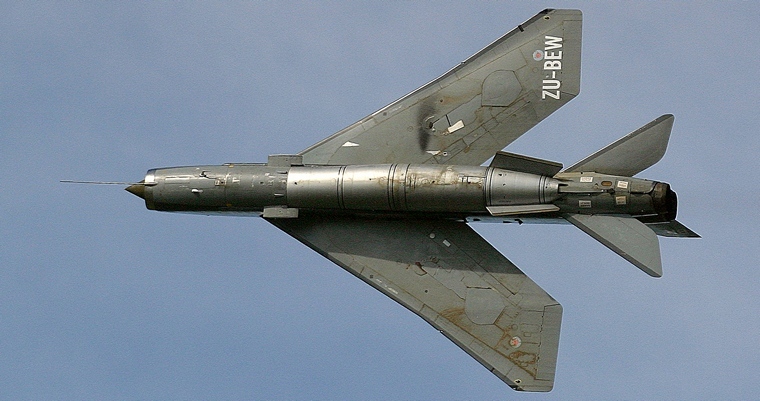 British Lightnings went on to serve until 1988 when they were withdrawn from service. By then 337 were build. A fair number of Lightnings are on display in museums and Jeremy Clarkson, of Top Gear fame, even had one parked in his garden for a while. 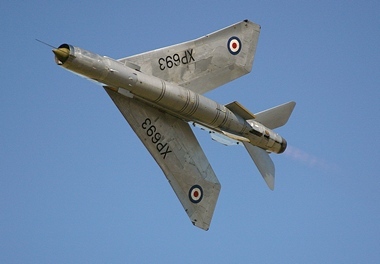 The Anglo-American Lightning Organisation, based at Stennis Airport, Kiln, Mississippi, has been involved in returning a T.5 to airworthy status. Engine runs reportedly took place during November 2013 but no further news has been forthcoming. 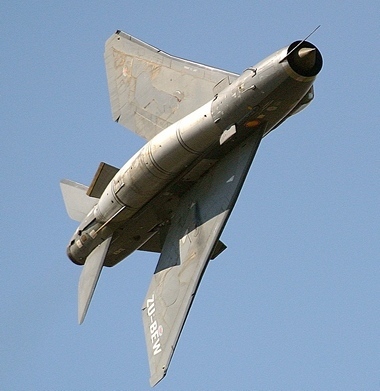 Cape Town based Thunder took delivery of four Lightnings during 2001. The aircraft flew more than 2,000 sorties and participated in airshows mostly in the Cape but also once at AFB Waterkloof. Following a fatal accident in 2009 during the TFDC Airshow the remainder of the fleet was grounded and on 22 August 2011. 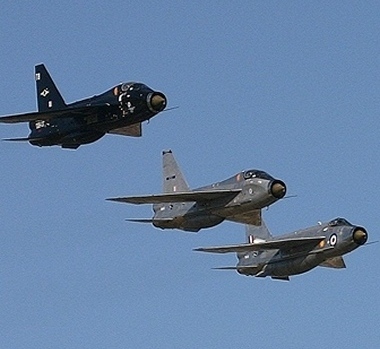 The fleet consisting of 3 T. 5 Lightnings, 3 Buccaneers and 4 Hunters were listed as 'for sale by private treaty'. On 14 Jan 2014 ZU-BBD (XS 452) flew again. The fate of her and the balance of the fleet remain unclear. 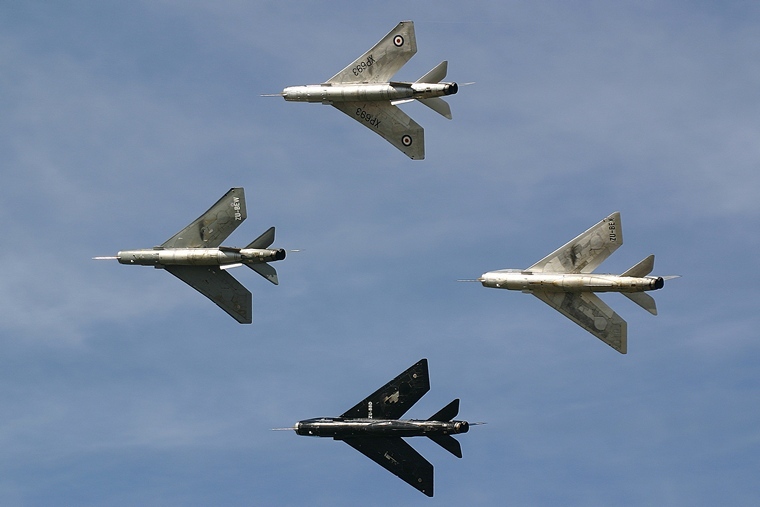 Lightnings served from 1957 to 1988 and except for three years of the duration of the Cold War was the main British and NATO deterrent against attack by Soviet bombers. It was the right aircraft for its time and will forever be one of the iconic aircraft in the history of aviation.